Do your applicants have the basic skills, such as attention to detail and spelling, needed to perform well in the job? Maybe, maybe not. How can you be sure? Your applicants may not have some of the basic skills that you take for granted. Our General Work Skills Test ("Identity GWS") can help you find out what they really know. 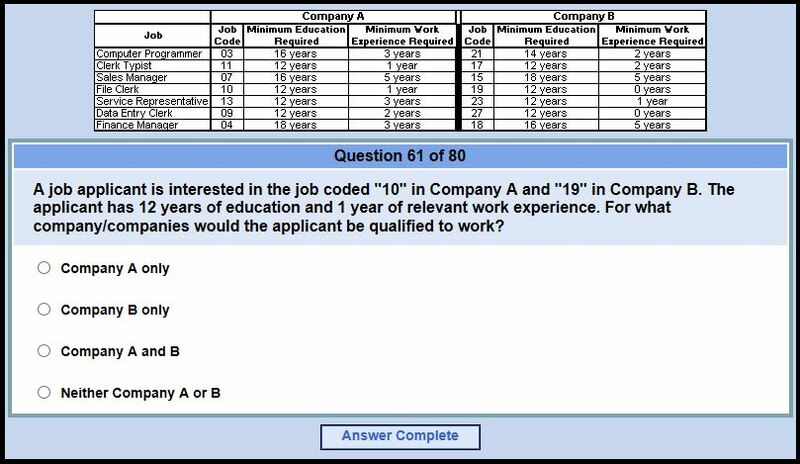 The EEOC compliant, validated General Work Skills test is appropriate for administrative / clerical to management positions (entry level to mid level). It takes about 25 minutes to complete. For a test sample, complete the form and enter "GWS" in the topics box. The test can be taken at your office or the candidate's home. After the test is completed, a Score Report is instantly emailed to you with the applicant's score. The score is presented in a percentile format (comparison to past test users) as well as raw score (correctly answered of the total number of questions). A two paragraph interpretation of the score is also included for each topic. The price starts around $20 per test for low test volumes, which is a relatively low cost to give you the confidence to make a better hiring decision. To see a sample or learn more, complete the form or call us at 1.800.836.1901. We will help you make more informed hiring decisions about your job candidates. Ready to get started right now? Just visit our Pricing Page for immediate access?